There was a potluck party at office last Thursday and we were assigned to prepare some appetizer. Many ideas came to mind, but I was very keen on recipes of every one's like/choice and also simple enough to prepare for 20+ people. I know if I would have assigned for any dessert, things would be very easy. Ideas started with spring rolls and ended up with very simple, easy to make sambar vadas. If the sambar is watery, soak vadas for 2-5 minutes before serving or else presoak the vadas in warm water for 5-10 minutes and then add to sambar. Its absolutely depends on how you prefer to eat. 1) Wash and soak urid dal for an hour and grind it to a fine paste. Add only < 2 handful of water to make a perfect batter. 2) Towards the end of the grinding, add salt, onion, coriander leaves, green chilli, ginger and pepper to the batter and make fine paste. 3) Make sure the batter is only light thick to get soft vada. 4) Heat oil in a Kadai/Frying pan. 5) Take another bowl with water near to your batter pan. 6) Dip your right hand first into water and take a lemon size batter and gently make a hole in center (As in dough nuts) using your right hand thumb. Please see here for detailed vada making. 7) Put this vada into oil slowly. 8) Repeat this vada making step for the remaining batter. Each time dip your hand into the water to make perfect shape of vada. 9) At a time you can put 3 to 5 vadas depending upon your pan and vada size. 10) Turn to other side to fry the upper part of the vada. 11) Fry till it becomes golden brown in colour. 12) When vada is fried well, remove it from oil and transfer it to a plate/bowl with the paper towel which absorbs the excess oil and allow it to cool. 1) Pressure cook the toor dal. Once cooked, mash using potato masher as much as possible. Keep aside. 2) Soak tamarind in warm water for 15 minutes and extract juice from it. Keep aside. 3) Take a pan and heat oil. When it is hot add mustard and urid dal. Allow mustard seeds to splutter. 4) Add curry leaves followed by chopped onions and saute till onions are translucent. 5) Add tomato and cook till they completely mashes. 6) If you are using veggies, add now and sprinkle little water to cook them. Continue cooking till vegetables become soft. 7) Add salt, sambar masala and turmeric powder. Cook for 2 more minutes. 8) Add tamarind juice, mashed toor dal and two cups of water. 9) Boil it till it reaches the sambar consistency. 10) Sprinkle a big pinch of asafoetida and mix well. 11) Remove from stove and allow it to cool for a while. 12) Transfer to a wide bowl. 1) From warm water bowl, take vadas and squeeze out the water absorbed by very gently pressing them in between your palms. 2) Put the vadas into sambar bowl for 2 minutes. 3) While serving garnish with onion, tomato, coriander leaves and sev. 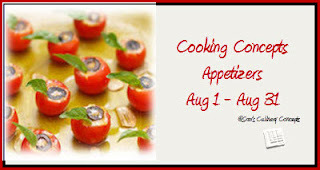 I am happy to send this recipe to Vatsala's Potluck Dinner and and Srav's culinary concepts. tats a perfect sambar vadai...so soft n soggy...very tempting clicks..so beautiful presentation ums..nice..
Thaks sangee. This words are really motivating me. Its OK with the name. My friends call me by that name only. wow very tempting sambar vada !! I love it !! Thanks for linking to my event dear !! Sambar Vada looks so tempting !!! 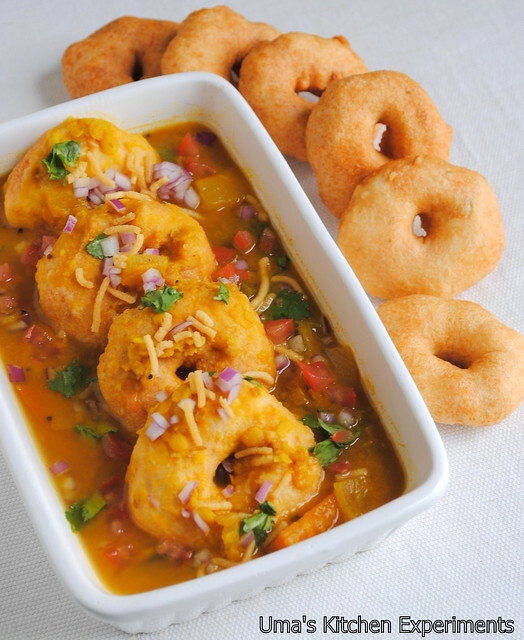 Sambar Vada.. Everyone's fav.. Looks so tempting.. 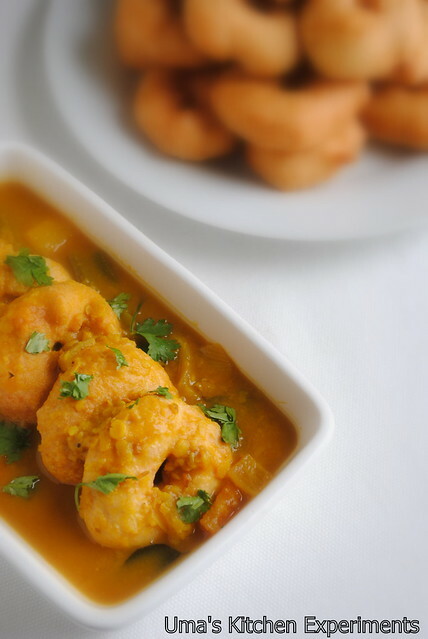 Fantastic clicks.. You can add few curry leaves.. Vada will be still more flavorful.. Some in chennai add coriander leaves too..
Drooling and mouthwatering . Lovely pictures. Great presentation and looks fabulous! So now you are making me hungry and it almost midnight :(. Looks yummy.